Hollis JohnsonWaffle House’s menus for emergencies are significantly more limited than the chain’s standard menu. Waffle House has secret menus for emergencies, including “no water” and “no power” menus. 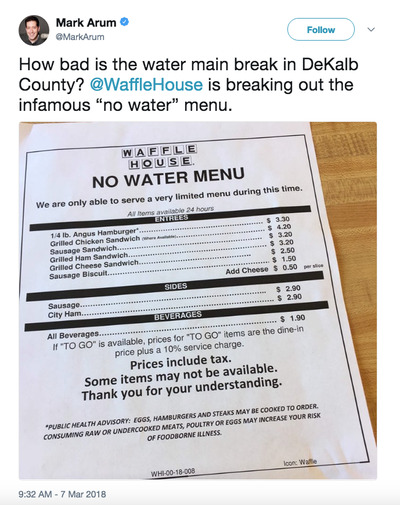 Locations in Georgia’s DeKalb County are serving the “no water” menu after a massive water-main break. Waffle House’s dedication to remaining open despite natural disasters resulted in the creation of standardised menus to be used during emergencies. 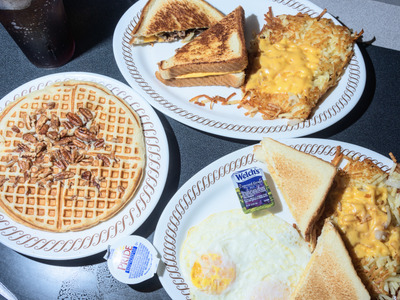 “If the restaurant has daylight and natural gas, we can cook something,” a Waffle House representative told Business Insider. Waffle House is pulling out one of its emergency menus, as DeKalb County in Georgia deals with a massive water-main break. On Wednesday morning, DeKalb County, which includes parts of Atlanta and some of its suburbs, issued a massive boil-water advisory, The Atlanta Journal-Constitution reported. Residents are told to boil water before drinking it after a water-main break caused flooding and mayhem in the area. Despite the lack of readily available water, Waffle House locations in the area are still serving up hot food. “How bad is the water main break in DeKalb County? @WaffleHouse is breaking out the infamous ‘no water’ menu,” WSB Radio’s Mark Arum‏ tweeted. Pat Warner, a Waffle House representative, confirmed to Business Insider that the chain had a national “no water” menu for use in emergencies and that just fewer than 20 locations in DeKalb County were serving the menu. The locations are serving only six entrees as well as bottled water and canned soda. The no-water menu also requires that locations use bottled water and serve food on disposable plates and cups. This isn’t Waffle House’s only emergency menu, according to Warner. Over the years, the chain has developed standardised menus designed to allow locations to stay open in a wide variety of situations. For example, when areas lose electricity, local Waffle Houses will start serving a limited “no power” menu. “If the restaurant has daylight and natural gas, we can cook something,” Warner said. Waffle House is known to be dedicated to staying open through natural disasters, something Warmer calls part of the chain’s culture. The US Federal Emergency Management Agency even unofficially uses a “Waffle House Index” that determines the impact of a natural disaster by how many Waffle House locations are forced to close. “If the community sees we’re open, it kind of brings back a sense of normalcy,” Warner told Business Insider.